Major political parties: There is one legal political party (a further two were deregistered in 2007 and 2008), which plays little role in the day to-day life of the country. Government: Since an abortive uprising in 1962, Brunei has been governed by an absolute, but benevolent, monarchy under a State of Emergency. The underpinning political philosophy is that of a ‘Malay Muslim Monarchy’. The Sultan is both Head of State and the Executive; he also holds the portfolios of Defence and Finance Minister. Acting as Prime Minister, he appoints a Cabinet of thirteen other ministers. The non-royal members were reshuffled in May 2010, several new Ministers were also appointed. They have a fixed five-year term. In 2004, the Sultan revived an appointed Legislative Council and brought in a series of Constitutional Amendments which envisage that in future it will partly be elected, increasing its consultational role. The Council has since met annually to discuss and approve the State Budget. The first women members were appointed in June 2011 Meanwhile, the State of Emergency remains in place. Head of State: His Majesty Sultan Hassanal Bolkiah of Brunei is also Prime Minister, Defence Minister and Finance Minister. Membership Of international organisations: Brunei is a member of the Association of Southeast Asian Nations (ASEAN), ASEAN Regional Forum (ARF), Asia –Pacific Economic Co-operation (APEC), the Commonwealth, the United Nations (UN), the International Maritime Organisation (IMO), Organisation of Islamic Conference (OIC), World Trade Organisation (WTO) and the Asia-Europe Meeting (ASEM). Chinese records from as far back as the 6th century AD show links with a country named ‘Po-ni’, which is possible was Brunei. Following the spread of Islam to the region with Arab traders, Brunei officially became a Muslim state in the 14th century. 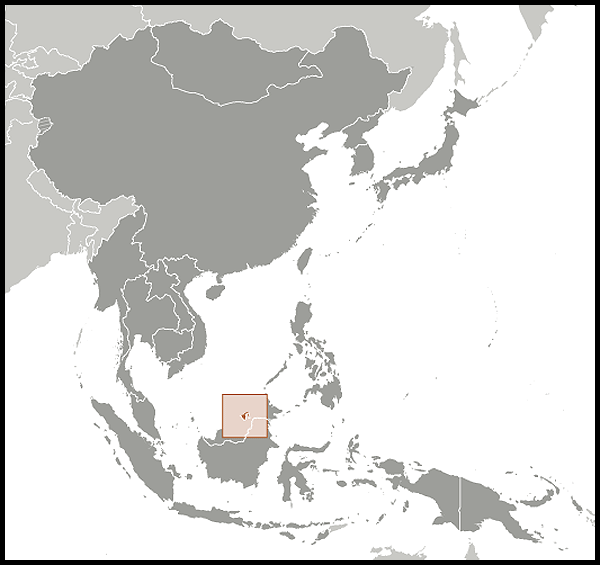 In the 15th and 16th centuries, Brunei became the dominant power in South East Asia and expanded its territory throughout Borneo and as far as the Philippines. Civil war in the later half of the 17th century began a process of break-up, which accelerated in the 19th century with the ceding of extensive territories on the island of Borneo to the Brookes family (the ‘White Rajahs of Sarawak’). Brunei was placed under British Protection in 1889 and became a full British Protectorate in 1905, with all matters relating to administration, legislation and taxation conducted on the advice of a British Resident. Brunei operates under a dual system of English Common Law and Shariah Law for Muslims in certain areas, though plans for an Islamic Penal Code have been announced. Apart from a short time during the Second World War when the country was occupied by the Japanese, the Residents remained effectively Governors of Brunei until 1959, when the Sultan of Brunei became responsible for the country's internal government, while the UK retained responsibility for Brunei's defence and foreign policy. The present Sultan His Majesty Sultan Haji Hassanal Bolkiah Mu'izzaddin Waddaulah and one of the world’s longest reigning monarchs, ascended to the throne when his father abdicated in 1967. In 1971 Brunei ceased to be a British Protectorate, although the UK retained some responsibility for foreign affairs and defence matters until Brunei became a fully sovereign independent state on 1 January 1984. Brunei's economy suffered a shock in 1997 when large losses were discovered in the assets of the Brunei Investment Agency. Since then Brunei has made some efforts to diversify the economy away from its almost total dependency on the oil and gas sectors. The Brunei Economic Development Board was set up in 2002 to identify suitable projects for economic diversification such as methanol production, Islamic finance, halal branding, and ecotourism. But progress has been slow. Brunei is also promoting itself as a tourist destination, capitalizing on its well-preserved rainforest and golf courses. In 1998, the Sultan's eldest son, Prince Billah, was formally installed as Crown Prince and heir apparent. Crown Prince Billah was married on 9 September 2004 to Princess Sarah, of Bruneian/Swiss parentage. In May 2005 he was appointed Senior Minister (without portfolio) in the Cabinet. Princess Sarah gave birth to a son, Prince 'Abdul Muntaqim on 17 March 2007. Brunei maintains good relations with neighbouring countries through its membership of ASEAN and frequent inward and outward high level visits. It also has close bilateral ties with fellow Islamic nations and other monarchies around the world. Acting with ASEAN partners, Brunei is playing an increasingly valuable regional role: making well-received interventions with peacekeepers in Mindanao, Philippines and as part of the EU-ASEAN Aceh Monitoring Mission in Indonesia. Brunei also sent humanitarian and medical aid for the 2004 tsunami in Aceh and the 2006 earthquake in Yogyakarta. Bilateral relations, based on the Treaty of Friendship and Co-operation, are historically very close. The Sultan, who attended the Royal Military Academy at Sandhurst, visits the UK frequently and met Prime Minister David Cameron in May 2011. His son Prince Mateen also graduated from Sandhurst in April 2011. There have been State Visits in both directions with HM The Queen visiting Brunei in 1998. The most recent royal visit was by TRH The Prince of Wales and The Duchess of Cornwall in 2008. There is also a regular flow of Ministerial visits to the UK and by Lord Mayors of London to Brunei, most recently in October 2008. The most recent UK Ministerial visit was by Lord Astor, Under Secretary of State for Defence in June 2011. British representation at the 50th Anniversary of the Royal Brunei Armed Forces (RBAF) in May 2011 further strengthened what was already a very healthy relationship. The UK maintains a Garrison consisting of a battalion of Gurkhas (the only permanent deployment of UK troops east of Cyprus) in the south of the country and a number of UK armed forces personnel are on loan to the RBAF. Training links are close with RBAF personnel attending training courses in the UK on a regular basis as well as attending the UK-run jungle training courses in Brunei and exercising with the Gurkha Battalion. Although over the years Brunei has looked to the UK Armed Forces to see what equipment they use, this has not automatically translated into defence sales for British defence companies. However, British companies are frequently engaged in tender competitions and are winning contracts. Education links are close and long-established. Britain remains a favoured destination for Bruneians studying abroad. There are about 2,000 Bruneian students enrolled in British educational establishments, at both secondary and tertiary level. The British Council's presence in Brunei is focused on the promotion of British education. 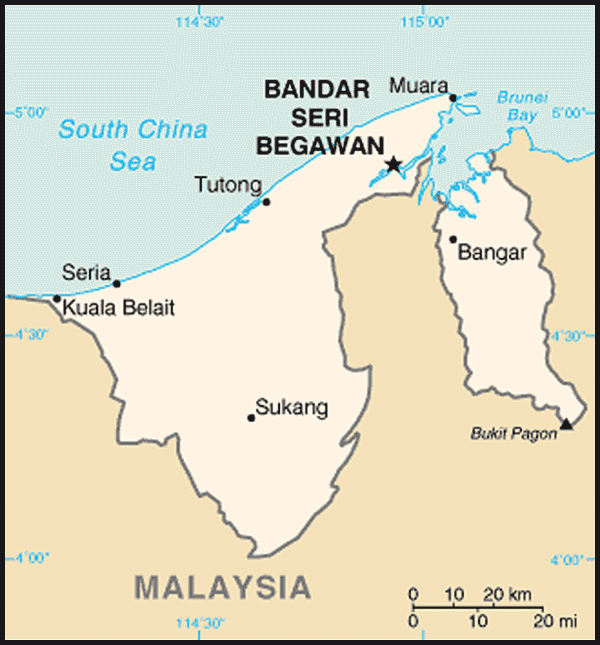 Brunei faces the South China Sea, along the north-west coast of the island of Borneo, four to five degrees north of the Equator. On its landward side Brunei is both surrounded and split into two by Sarawak, a state in Malaysia. Most of Brunei is within the Borneo lowland rain forests ecoregion that covers most of the island but there are areas of mountain rain forests inland. It is also the only sovereign state completely on the island of Borneo, with the remainder of the island belonging to Malaysia and Indonesia. Trade figures between Brunei and the UK are substantial for Brunei's size but highly variable. UK exports are mainly in engineering (especially in the oil and gas sectors) and luxury goods. Investment figures are difficult to ascertain, but a significant amount of Bruneian money is invested through the City of London. Other invisible earnings are also significant, e.g. in legal and accounting services. The major UK investment in Brunei is Shell's stake in Brunei Shell Petroleum and Brunei LNG, which develop Brunei's oil and gas reserves. Although Brunei is not a parliamentary democracy and is ruled under a State of Emergency, the country has a generally good human rights record. Amnesty International has highlighted small numbers of detentions under the Internal Security Act (ISA) for alleged attempts to convert Muslims to Christianity and for making defamatory remarks on the Internet. The death penalty exists for murder and drug trafficking. The last execution was carried out in 1992. Brunei is considered a de facto abolitionist state. Under the Constitutional Amendments promulgated in 2004, Habeas Corpus was repealed and acts by HM or his government were exempted from recourse to Judicial Review.